The strength of radiation can be measured in many different ways. The unit we are using in this report is called a roentgen. Its technical definition involves the ability of radiation to knock electrons out of air molecules (i.e. to ionzie them). 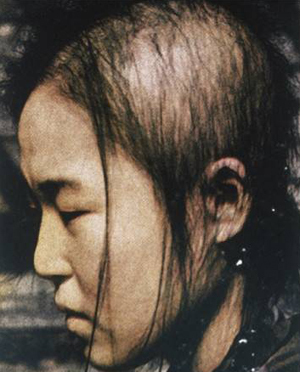 Epilation of the scalp, beginning on the nineteenth day, three days after the appearance of purpura. Scattered long hairs of the original growth remain. Patient was inside a wooden building at Nagasaki. Leukopenia persisted for two months, but the patient recovered. When radiating waves or particles pass through any substance, at least some of them bump into molecules. The effect may be no more than to knock a few electrons out of the molecules, or it may be more dramatic. But even if just a few electrons are knocked loose, the molecules become very active chemically, and form new combinations. Now a living cell is a marvelously delicate balance of interacting materials. Hence any chemical change in a cell, however slight, may have serious effects, It may substantially change the normal life processes, or even kill the cell. When a complex organism is exposed to radiation the degree of damage, if any, depends on which of its body cells have been affected. In the aftermath of the atomic bombings of Hiroshima and Nagasaki, the genetic effect of the radiation exposure was a compelling concern to both scientists and the general public. In every plant and animal species adequately studied, radiation resulted in deleterious mutations.